As Manuel Pellegrini heads out of Manchester City it’s imperative that his soon-to-be ex-employers stay where they’ve been all season long – in the top four of the Premier League. When City began the season with five consecutive wins, without conceding a goal, they were odds on favourites for a third PL title in five years – virtually unstoppable. This Charming Man…is leaving the building after Sunday’s match with Swansea. Finishing outside the Champions League places was inconceivable. Fast forward nine months and the unthinkable prospect of Pep Guardiola inheriting a squad heading for a Europa League spot wasn’t such an outrageous proposition after all – it was a grim reality. Last Sunday’s 2-2 draw with Arsenal, followed by an ignominious Etihad farewell to The Engineer, left City teetering on the brink of Thursday nights in Europe next autumn. 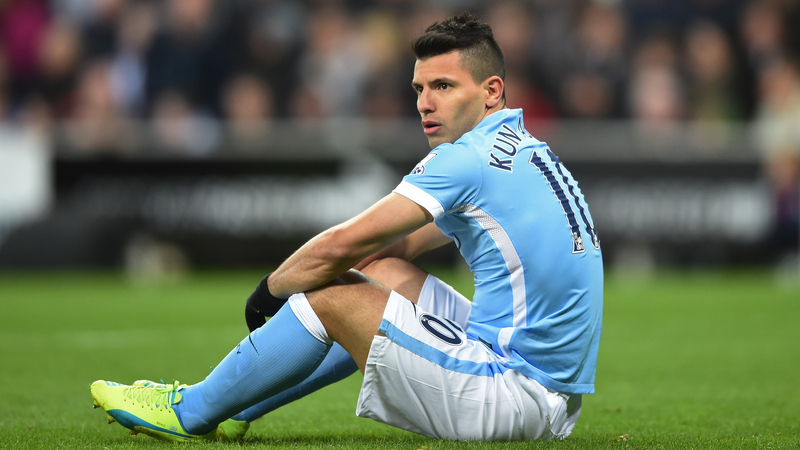 Hot shot – Sergio opened the scoring against Arsenal but City had to settle for the draw. The indignity of surrendering a top four place to, of all teams, Manchester United, was inexplicable – how the hell had it come to this? As we now know, City were handed a ‘Get Out of Jail’ card when the Happy Hammers – the departing Irons of the Boleyn Ground – smashed the Trafford troglodytes, both on and off the field on Tuesday night. City’s European destiny for 2016/17 is now, once again, in their own hands as they shape up to face Swansea City on Sunday. KDB wonder goal – De Bruyne’s glorious strike is one of 16 goals the brilliant Belgian has netted for City in his debut season. A draw will guarantee fourth spot. A win, coupled with a highly unlikely Arsenal defeat to hopeless, hapless Villa, would elevate City to a third place finish and avoid a tricky two-legged Champions League qualifier in August. A loss in South Wales and a United win over Bournemouth simply does not compute! Bale Out – a cruel deflection off Fernando gave Real Madrid a narrow Champions League semi final win. Undeniably, injuries are part and parcel of football – always have been and always will be – but modern day squad ‘rotation’ of players is supposed to offset the worst effects. 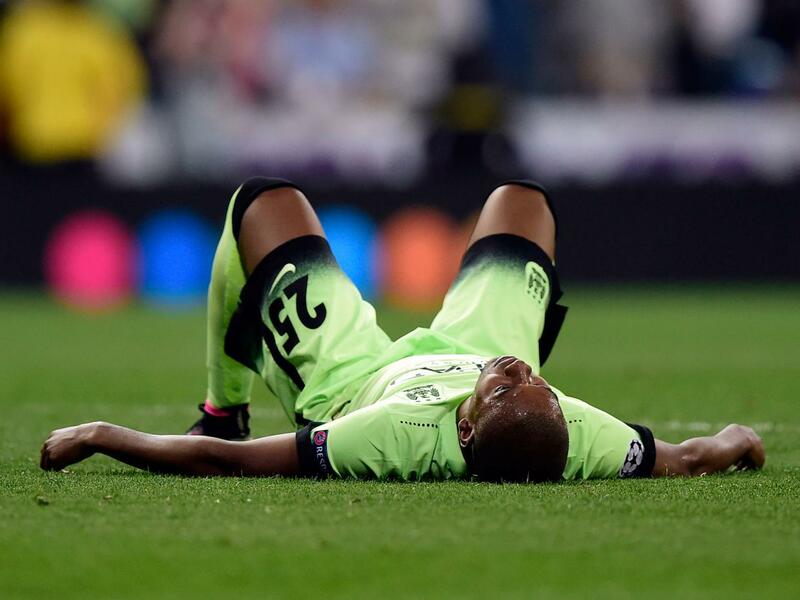 Good Kompany – City look bad at the back when Captain Vincent is sidelined by his numerous injuries. City suffered more than most this season, whereas Leicester City – deserving Champions that they are – were comparatively injury free. In truth what team could withstand the long term absence of players of the calibre of Kompany (25 PL games missed*) Zabaleta (25*) Silva (14*) De Bruyne (12*) Aguero (9*)? City’s detractors misleadingly refer to ‘the ‘size of City’s squad’ – the Etihad squad is the same as every other club – 25 players. Penalty shouts – City have been denied numerous ‘stonewall’ penalties this season, including this foul on Sergio at Leicester in December. The misnomer that good and bad refereeing decisions balance themselves out has cost City in some of the big games. Aguero denied a certain penalty away at Leicester, Everton’s John Stones wiping out Raheem Sterling in the last second at the Etihad, the same Sterling being idiotically – some might say, maliciously – penalised by Clattenburg against Spurs for a ‘handball’ that didn’t happen. 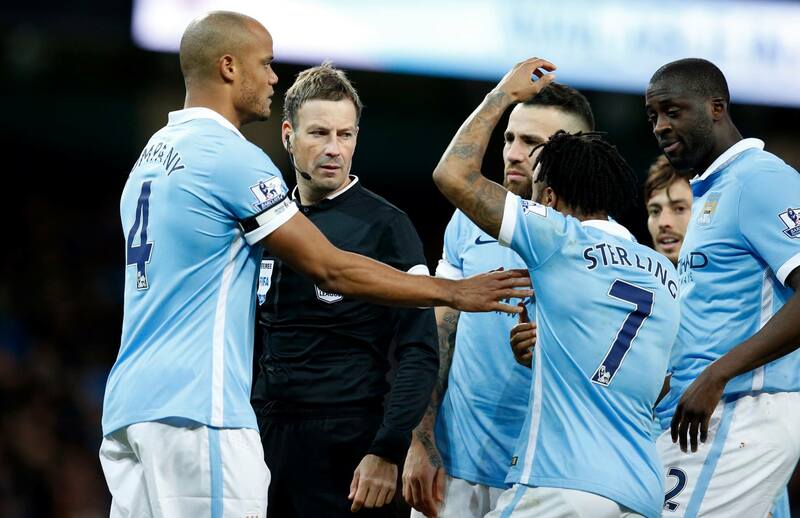 Never a penalty – Raheem Sterling protests his innocence to controversial Clattenburg to no avail. This will be the same Twattenburg awarded the FA and Champions League Finals as his reward for yet another season riddled with strange and questionable decisions. Yes, City did benefit occasionally from officiating gaffes e.g. Sterling’s out of play pull back for KDB’s strike in the League Cup semi final against Everton, but City were sinned against far more than they were the sinners. Bemoaning City’s luck is one thing, the real truth lies in a litany of underwhelming displays, often bereft of on and off the field leadership, individual errors and, at the worst of times, a lack of professionalism and application by some players. Down and out at the Bernabeu – Dino tastes bitter defeat to Real Madrid. The only thing consistent about City this season has been their inconsistency. After back-to-back 6-1 and 5-1 slaughters of Newcastle and Bournemouth in October, it took until April to once again record consecutive Premier League wins – disgraceful stuff. Worse still is City’s abject record against the top teams – just a solitary win over Southampton – offset by home and away defeats to Spurs and Liverpool, and scraping one point out of six against Leicester, Arsenal, Manure and West Ham. Kane conversion – Spurs go one up in a 2-1 win over City with the penalty that should never have been awarded. It’s easy – too easy – to claim City’s title hopes tumbled once news of the managerial changeover became official on the last day of the January transfer window. 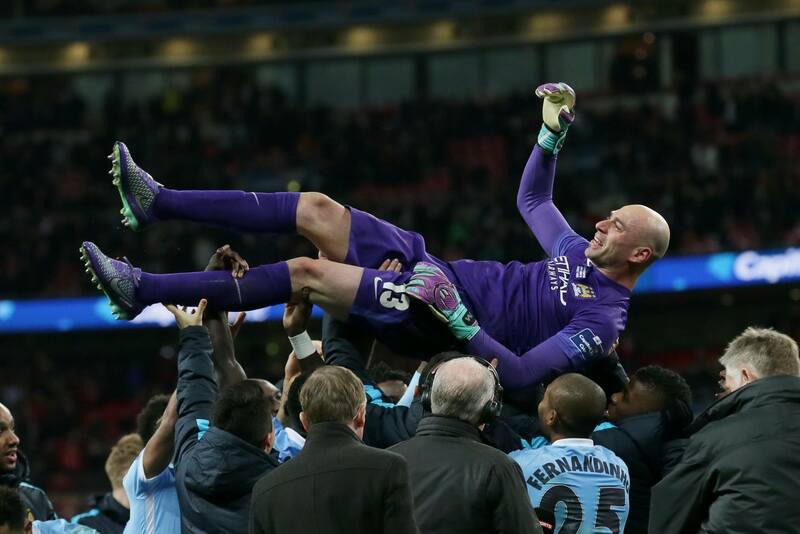 Far more damaging was the loss of Kevin De Bruyne just four days earlier, carried off in that momentous 3-1 win over Everton, which took City to Wembley and ultimately League Cup glory. 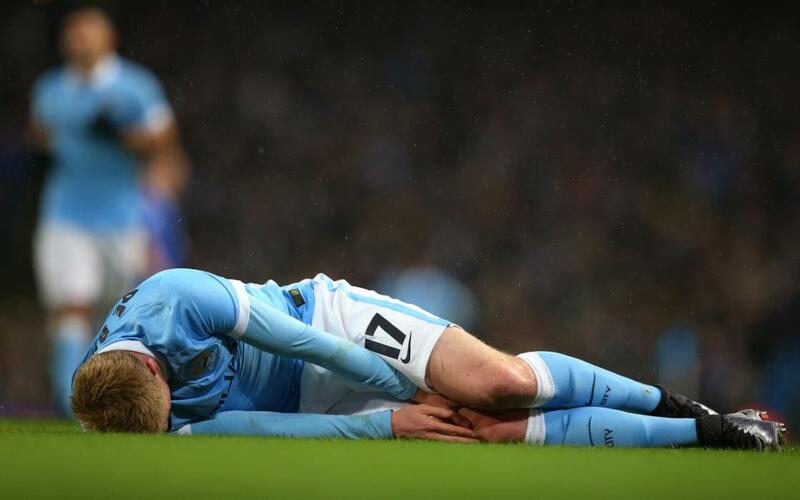 The moment the wheels came off City’s Premier League title bid – KDB lies stricken against Everton. The Willy Caballero Show and progress into the quarter finals of the CL couldn’t mask a wretched run in the league, where City squandered 14 out of 21 points in the absence of KDB. There’s easily half-a-dozen players who will surely not survive Guardiola’s arrival (compile your own hit list) but, as a collective, City’s form dipped lower than that dachshund in the Vitality Health Life Insurance adverts with Jessica Ennis-Hill! Defenders couldn’t defend, midfielders could create and attackers couldn’t score. The CFA training manual relating to closing down opponents, denying them space, tracking back and pressing hard, may as well have been written in ancient Mandarin – hardly any blighter in Sky Blue or Glow in the Dark City Green – was ready, willing and able to do it. Century Boy – Sergio scored his 100th Premier League goal for City at Newcastle but the Blues still dropped another two points. Having failed abysmally against top of the table teams, City also contrived to drop six away points at relegated Villa, Norwich and Newcastle. Injuries may have affected the backbone of the side, but it doesn’t come close to explaining or excusing a procession of spineless showings, more recently the shocker at St. Mary’s and the toothless display in the Santiago Bernabeu. 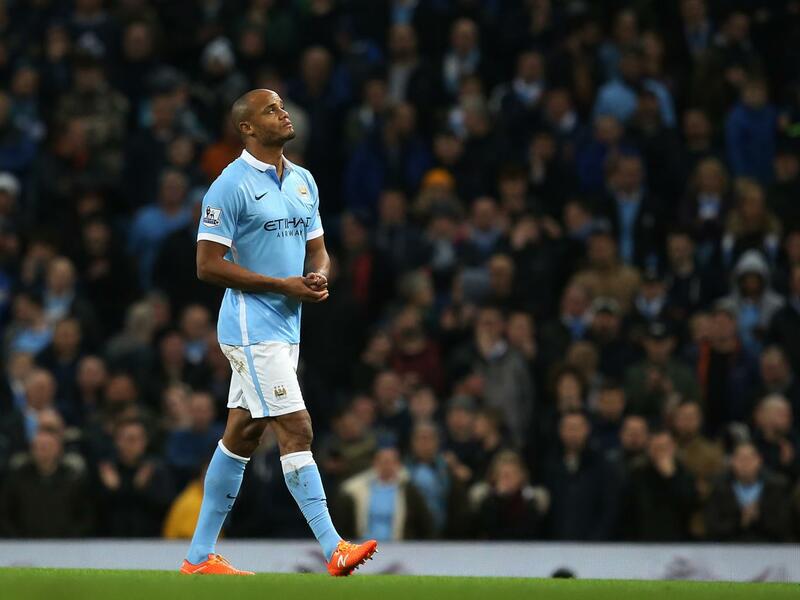 Saints against Sinners – City’s defending was absolutely shocking in the 4-2 defeat at Southampton. It’s a measure of the expectations at the Etihad that a season that has brought silverware, a Champions League Semi Final berth and – fingers crossed – Champions League qualification, is viewed as mediocre. In truth, Manuel Pellegrini was always ‘minding the shop’ until Pep finally hooked up once again with his Spanish compatriots Ferran Soriano and Txiki Begiristain. The likeable 62-year old has enhanced City’s European pedigree, but – and it’s a significant but – that’ll count for little if City surrender at the Liberty Stadium and slither into the Europa League. 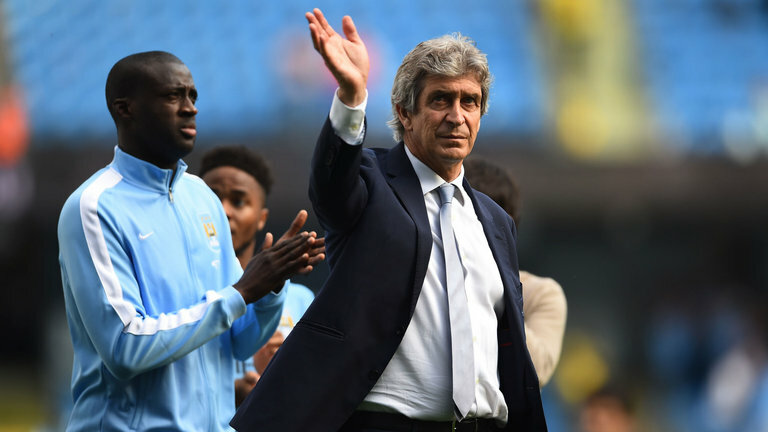 Bye bye and adios – Manuel waves farewell to just 5,000 remaining City fans at the Etihad…Yaya isn’t far behind him! 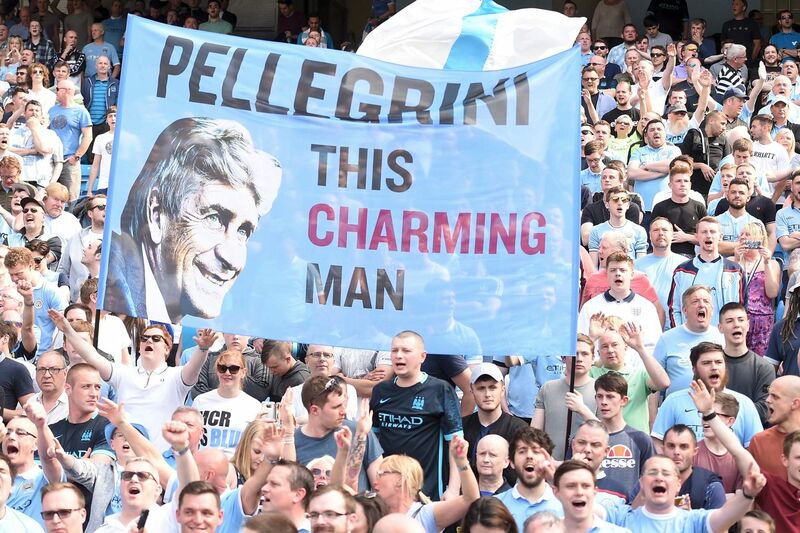 Not trusted by a significant percentage of City supporters, Pellegrini has long divided opinion among the fans. Often accused of not having a proverbial Plan B, City’s sitting MP has taken all of any flak doing the rounds, over the last three seasons. Not given due credit for his achievements, he steadied a rocking boat when the tempestuous Roberto Mancini left City in disarray. 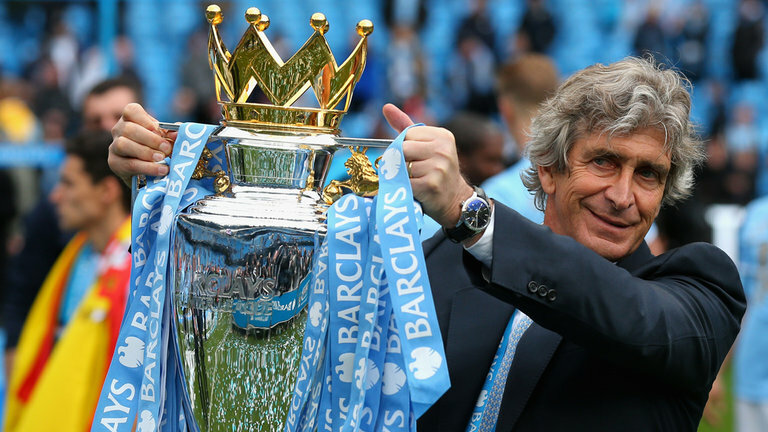 Lest we forget – Manuel did win the Premier League title for City – thanks MP. Perhaps hindered by some questionable transfer acquisitions – who is the real powerbroker and wheeler-dealer in chief at City, is it the incumbent manager or Txiki – the cool Chilean has absorbed all the heat from disgruntled fans and a usually hostile media mob. 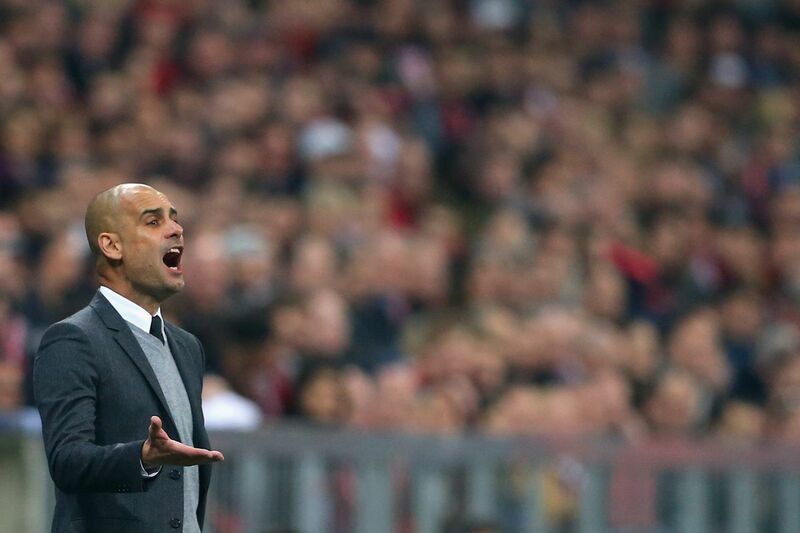 He’s more than done his job in the eyes of the City hierarchy, if not through the sceptical gaze of many fans. The presumption that Guardiola will deliver sustained Premier League success is well founded based on his domestic triumphs in Spain and Germany. Pep talk – Guardiola will demand so much more from City’s players next season. Whether he can turn City into the Champions of Europe is a more contentious issue after failing at three attempts with a club far more accustomed to picking up European club football’s biggest prize. Any Pep talk will have to wait. A final day victory and the possibility of a twin gold strike – Sergio for the Golden Boot and Joe for the Golden Glove – will chase away any dark clouds and put a healthier sky blue hue on MP’s three-year Etihad tenure. Top article again my friend. Agree with everything in it. 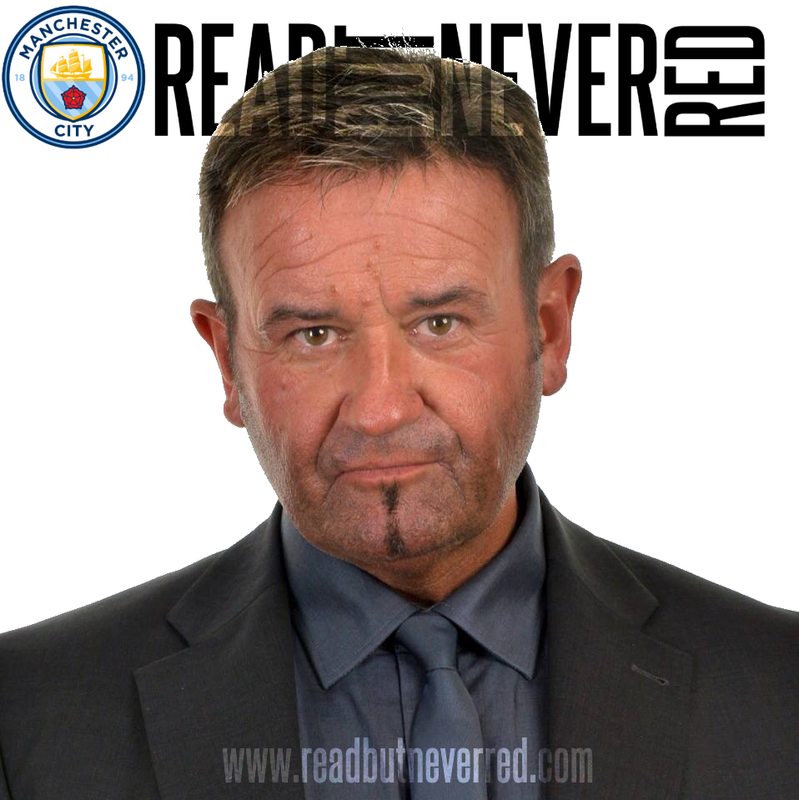 Some have slamed the club for announcing peps arrival & blaming it for being part of our poor form possible correct who knows.But not sure if it could of been handled better was it going to leak out anyway is that the reason who knows. Now we're down to the last game & the players & management owe the fans big time. Could take not being fourth but not surrendering it to the heathen lot. That can't happen so come on City one last big push do it for yourselfs but do it for us the fans please. Bang on Doug - we'll resurrect a City # OF 2013/14 #TOGETHER. Off nice and early down to South Wales. I used to work as a journalist on the South Wales Evening Post so here's to a great day out with Mrs W, three points, a Champions League spot and back in time to pick Miss Mollie Zaba up from the Doggie Day Club. Well constructed piece as ever Dave, it's difficult to disagree with anything you say without being pedantic. On that note MP is only 62, I know that for reasons which I think you appreciate. ? Can't fault any of your comments David - in Swansea for hopefully a happy ending, but long drive home if Europa League ! Thanks RC - hopefully see you down in Welsh Wales! Completely agree so hope Messrs Demichelis Kolarov & Bony are conspicuous by their absence, to name but three. Kind of you to say so Stuart - thanks for reading and commenting. That summed the season up pretty well. I think the most irritating thing of the whole season for me has to be Raheem Sterling. Can't finish, pass or cross and when it come to a tackle jumps out of the way. Yes he has pace, well so does my dog, but she would not get a game for City! Yes, it is amazing how a different manager can get something extra out of certain players (remember Gary Megson before and after Howard Kendall arrived). Who could have know that Kolorov could be the new Franz Beckenbauer ! 143 Fraudulent Manchester City signings!